This is my first “Pepsi” style ‘Divers’ watch. 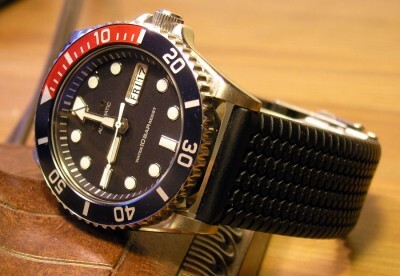 It is not a true diver, since it lacks: More than 100m water resistance and unidirectional rotating bezel. That being said, I am not a diver, and if I was, I have my Orange Bullet, that is a true diver. Case: 39mm diameter, stainless steel, 100m water resistance. Back: Stainless Steel, screw down, Double Wave 100m water resistance stamp. Movement: Automatic, 7S26 Seiko in-house design. Complications: Day of Week, Date. Other: Folded Link, stainless steel bracelet, Bidirectional Rotating Bezel, Screw Down Crown, Luminous Hands and Markers. This watch looks just amazing on the wrist. Looks enough like a Submariner, without being a copy. Fit and finish are typical Seiko, flawless. It is thinner than my real diver, which is nice for day to day use. The bracelet looks wonderful (but was a bear to remove a link). It is folded links, but looks very nice. It is thin, in a pleasing way. I can even swap the bracelets between this and my Orange Bullet. They both use 22mm lugs. Luminescence is great, probably my second best. One odd thing I noticed it was hard to see the applied Seiko marker on the dial. The reason is that when they made the watch, the face of the marker is EXACTLY parallel to the face of the watch. So when you see glare on the hardlex, you see glare on the silver marker. To achieve this kind of precision on a mass made watch is remarkable. So far, I love this watch, and it keeps great time as well (less than 10s/day).